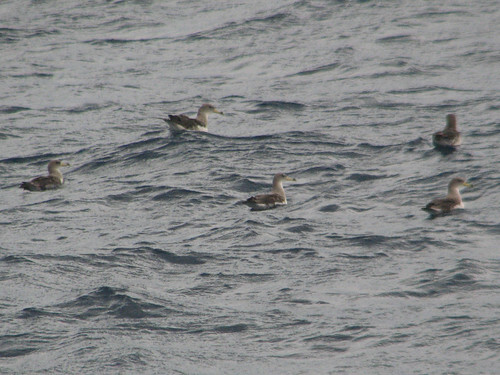 My first pelagic birding trip! 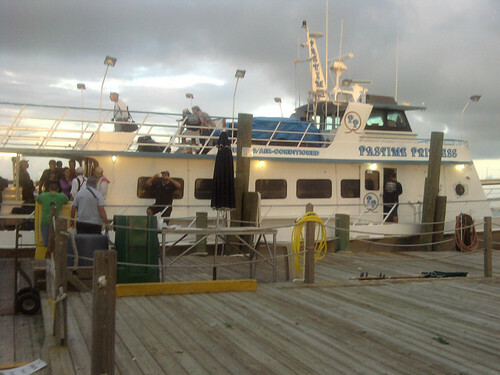 Last Sunday, September 18th, I joined a pelagic birding trip on the Pastime Princess out of Ponce de Leon Inlet, Florida. 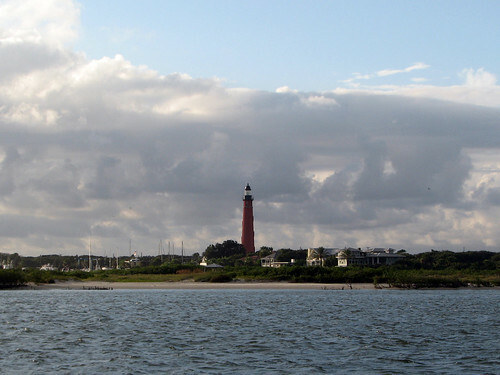 The trip was sponsored by the Marine Science Center; there were 43 birders aboard. We departed at about 5am and before we got out of the harbor a downpour drove everyone on the upper deck downstairs. I got soaked but dried off fairly quickly after the rain (the first shower of several throughout the day) stopped. As soon as we were out of the harbor the water got quite rough – well, more rough than I had expected anyway. The ship was rocking and rolling and I held onto my seat, scared to get up. 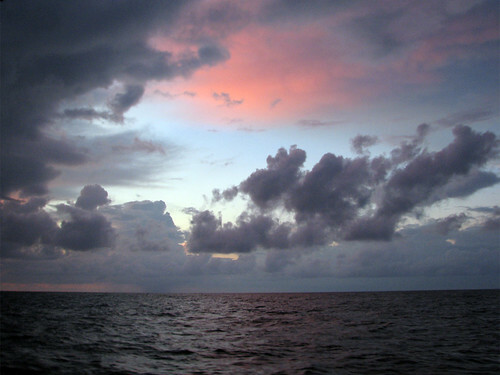 The seas were pretty rough throughout the whole day, but I got used to it eventually and could walk around the ship once it was daylight. I saw at least seven different people get sick but luckily my one Dramamine and my laser-focus on the horizon throughout most of the journey kept my stomach settled. I also ate like a bird, and I’m sure that helped too. 🙂 The video below gives an idea of how the trip was – during a relatively calm part of the journey. 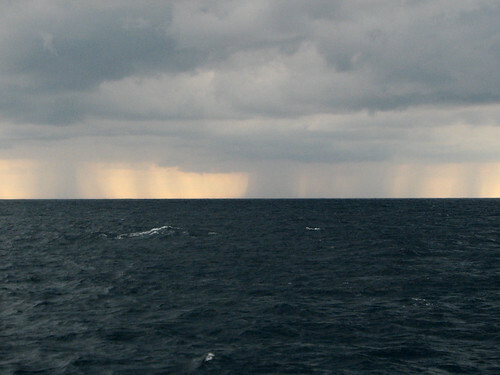 Rain in the distance. It reached us, eventually. 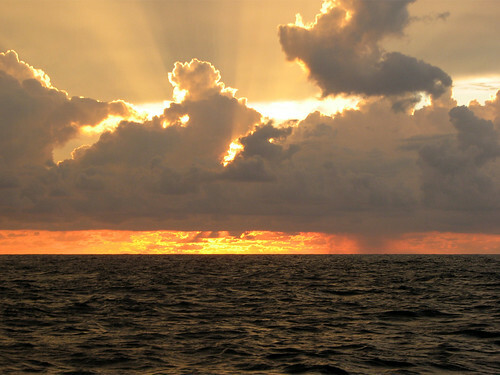 After the first rough patch of seas, the sun began to rise. My photos don’t begin to capture the beauty of the sunrise, but I remember thinking at the time that even if we didn’t see any birds, the trip was already worth it. 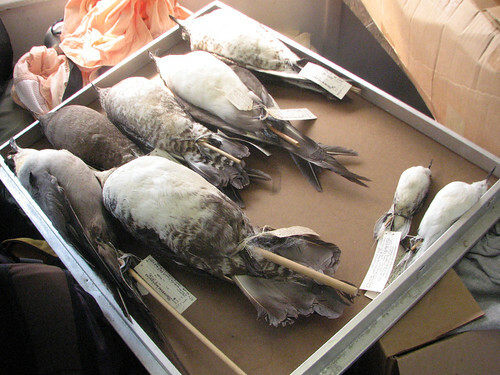 One of the guides brought along a bunch of study skins of birds we hoped to see during the pelagic trip. These were really interesting to see and we got a nice explanation and close-up look at the skins during the last part of the trip. I got six lifers on the trip. Remarkably, I didn’t have too much trouble picking up the birds in my binoculars. Taking photos of the birds, however, was a comedy of errors. Everything is on the move so just finding something in my viewfinder was a challenge. I only got shots of a few birds, all lousy. 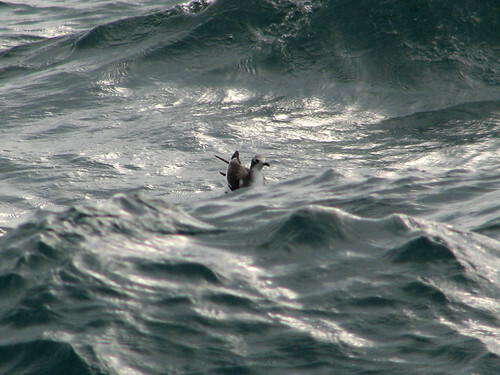 A couple of photographer birders on the trip got excellent shots of some birds, and I’ve linked to them in this list (my lifers): Black-capped Petrel; Cory’s Shearwater; Great Shearwater; Audubon’s Shearwater; Sabine’s Gull; Sooty Tern. I also saw potential lifers Wilson’s Storm-petrel and Red-necked Phalarope, but they were so tiny I can’t count them on my list. 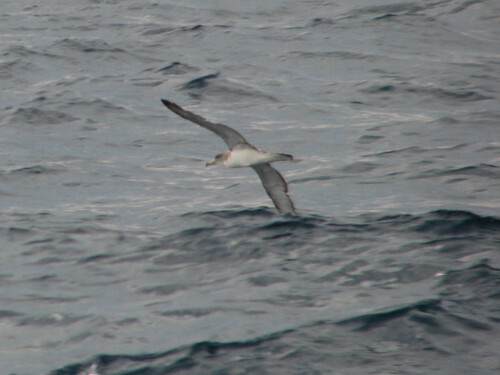 Incidentally, we ended up seeing a large number of Black-capped Petrels throughout the day for a conservative total of 45 birds – a one-day Florida record. Something really sad to see was a Black-throated Blue Warbler about 50 miles out from shore. This tiny bird circled the boat for a while and everyone was quietly rooting for it to land somewhere on the ship to take rest. At one point the bird even flew inside the main cabin, but it eventually left the ship. I read on the trip leader’s report later that at least two other warblers were seen during the day. 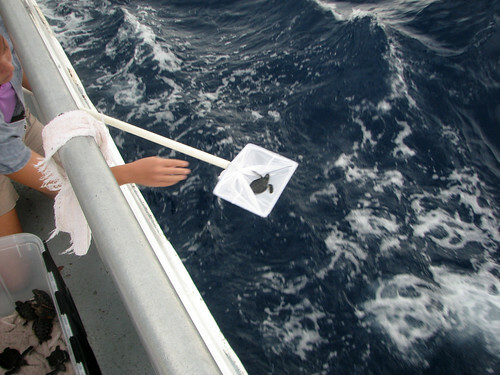 Besides the birders and guides, an employee from the turtle hospital at the Marine Science Center was aboard. 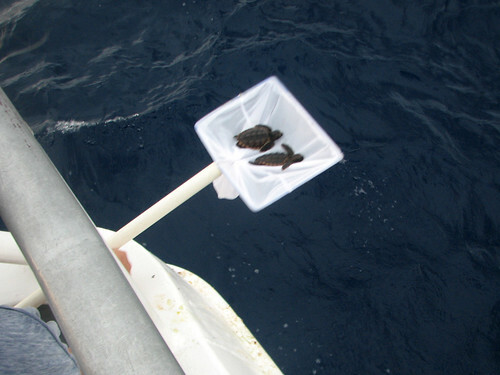 She brought along some baby sea turtles to be released during our voyage. Baby turtles!! 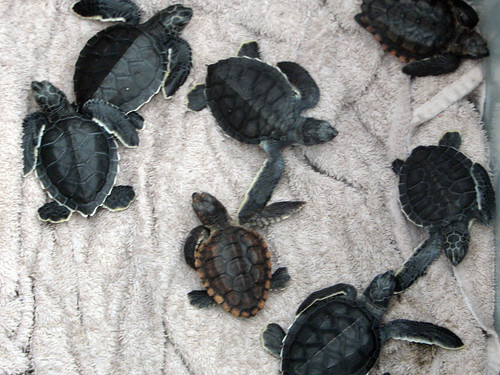 In the photos below, the ones with the light outline are Green Sea Turtles and the brownish ones are Loggerhead Sea Turtles. 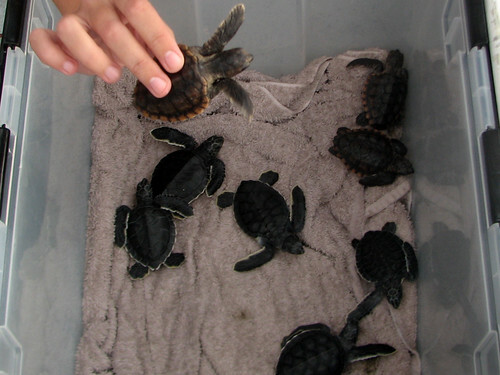 The babies were in the care of the Center for a variety of reasons, and were aged between three and four weeks. We tried to find a large bed of sargassum for the release, but all we could find were long strings of the sea grass. Finally we found a suitable spot and the turtles were released. 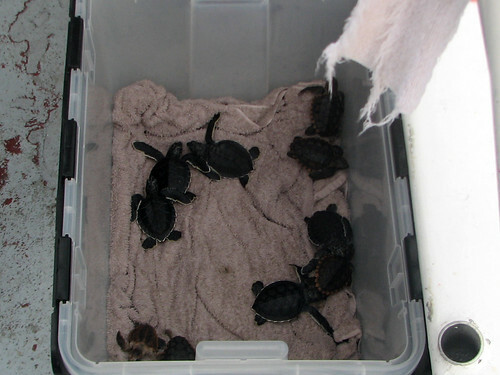 A baby turtle or two was placed into a net and they were lowered to the water. They all swam off immediately. This was very, very cool to see! 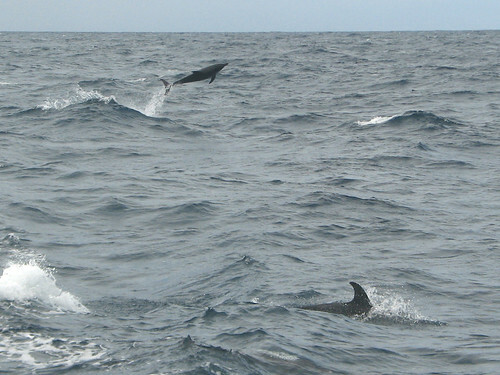 Birds were the focus of the trip, but we were also treated to several sightings of Atlantic Spotted Dolphin pods. 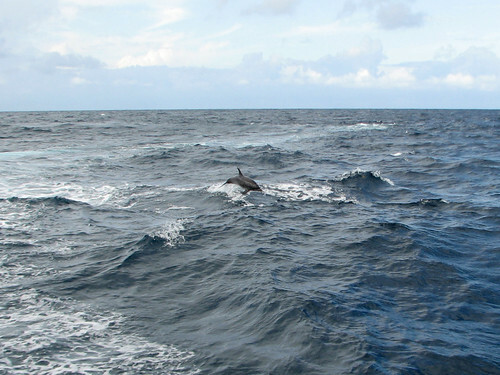 I captured just a few pictures, but we saw dolphins on several different occasions and we were treated to many, many full breaches. Always a treat to see dolphins! Another non-bird sighting was a huge adult Loggerhead Sea Turtle, again very cool to see! The boat also scared up a lot of flying fish. I hadn’t seen these before and their quick flights made me giggle. 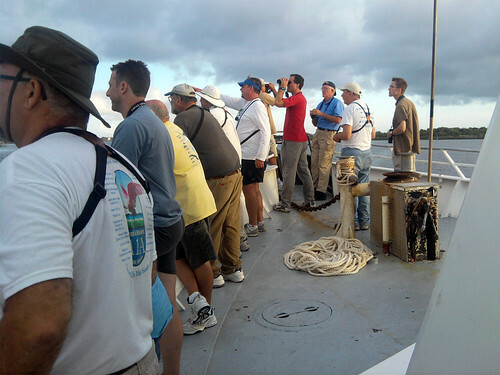 While most birders were either glued to a seat or hanging on to the railings during our time at sea, most everyone stood up during the leisurely sail back into port. 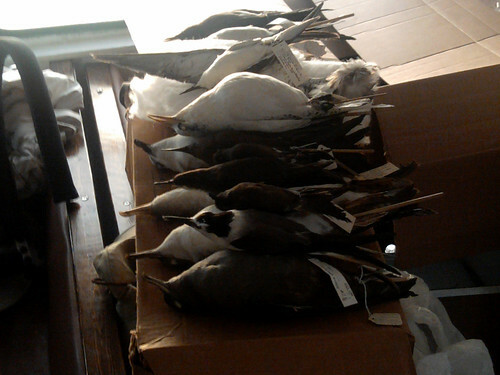 We picked up quite a few day birds on the way in, including 60+ Brown Pelicans, Ruddy Turnstones and Caspian Terns. 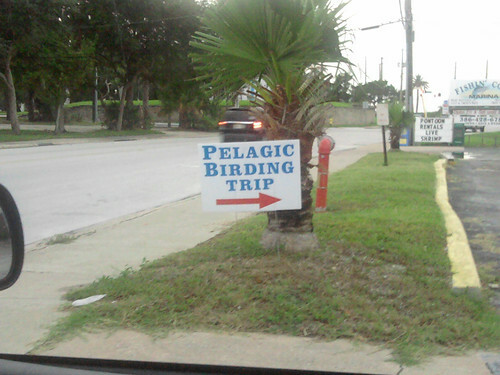 This entry was posted in Florida, Pelagic, Volusia Birding. Bookmark the permalink.